노동과건강 - Head opened, leg broken..No Worker’s Compensation! Head opened, leg broken..No Worker’s Compensation! Flashing back 10 years ago in shipyards, there were so many deaths. While welding in a dark LPG cargo tank, he saw a ‘devil-like blooming’ smoke from the tank. It was a fire. The friendly shout of “Bro, come out and have some bread” changed to a scream of “Get out!”. His colleague who told him “Let’s have something and take a break” just a while ago did not come out of the ship alive on that day. He let so many friends go in that way for the last 10 years. He also just missed several fateful moments. He had his head opened, ribs broken and back hurt many times. However, he never claimed the Worker’s Compensation for fear of reprisal from his employer in Ulsan shipyard. The shipyard welder, Mr. Young-bae Kim (52) who worked for 11 years at shipyard said, “Hyundai Heavy Industry (refer to as HHI below) was built by our worker’s deaths”. In August last year, Mr. Kim a subcontract worker of Hyundai Mipo Dockyard fell down from a 2 meter high scaffold. He was chased by the manager that the process was behind schedule and he had to rush to finish even working after hours. As he welded, sparks flew up everywhere and the flames also went into Mr. Kim’s work shoes. Worried about a burn, he was just about to take off his shoes and the stepping scaffold collapsed. He fell down to the piled equipment and was injured. There are scaffolds set around the worksite in shipyards, so that they can easily access to work in height but it was loose at the time of injury. ‘The accident was waiting to happen’. As the fall wasn’t considerably high, he thought it was a minor contusion but he couldn’t move himself or talk. It was a rib fracture. He was admitted at the hospital. The day after the incident, the subcontracting company manager called him. His first word wasn’t ‘how are you? Are you okay?’ but blame “I’ve seen so many workers with fractures at the shipyard but you’re the one who was admitted at the hospital”. Even though you are injured at work, conceal first. This is an unwritten law for subcontracting companies at shipyard so many occupational injuries are covered up. Though people cut their hands by grinder, break bones by fall from a height, they either pay out of their pocket saying ‘injured at home’ or their subcontracting companies pay medical expenses (providing treatment cost or other compensations under the condition that workers do not request the Worker’s Compensation). This is due to the ‘invisible rule’ that subcontract worker who applies for the Worker’s Compensation must leave the company. 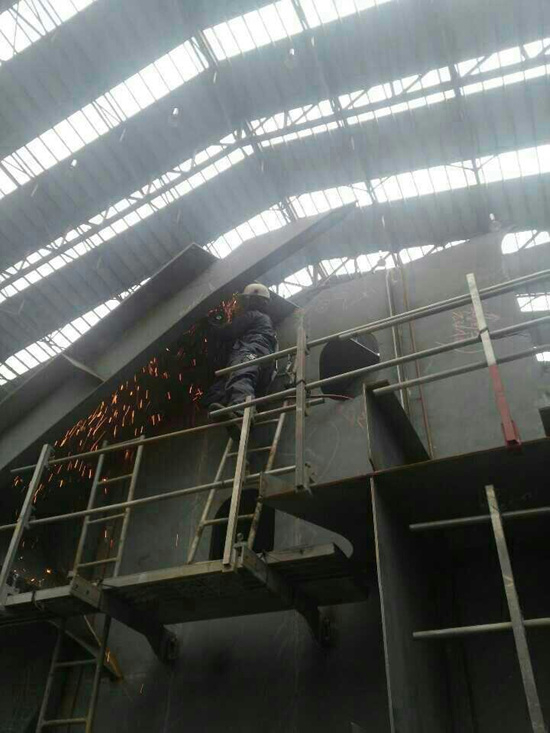 “The shipyard owner gives subcontracting companies pressure to achieve ‘incident free’ environment and subcontracting companies conceal occupational injuries to gain more contracts or renew contract with shipyard but they can no longer hide if their worker reports to Worker’s Compensation. Then, the reported worker cannot survive in the subcontracting company anymore.”, the Metal union HHI branch director, Mr. Chang-min Ha said. He has recently conducted ‘Investigation for Occupational injuries concealment’ six times. Following the accident, Kim wanted to process his case through the Worker’s Compensation but he agreed to be treated according to their regulation due to company’s ‘pressure’ or ‘begging’. When he first mentioned the Worker’s Compensation, his company owner who never even called him for over a week after the injury came and begged ‘Help me’. His company wasn’t even insured for Worker’s Compensation. Kim was a rather lucky case. Through long negotiation with his company, he received all treatment cost and 100% daily rate for the days he missed during his admission. It was due to the obvious fault of the company not joining the Worker’s Compensation. However, most can’t even claim the Worker’s Compensation. According to Hanlim University Education-Industrial Cooperation’s ‘Research for occupational injuries risk high jobs’ requested by National Human Rights Commission last year, only 7.2% of subcontract workers who experienced an occupational injuries benefited from the Worker’s Compensation. 60% were paid by their subcontracting companies, 28% paid out of their own pockets for treatment and 4.8% didn’t even seek treatment. As to why they did not apply for the Worker’s Compensation (including plural response), the answers were ‘To avoid any disadvantages from shipyard or subcontracting company’ came the first (79) then, ‘By the subcontracting company’s request to not to apply for the Worker’s Compensation’ followed (52). It was even more serious in HHI alone. According to ‘Investigation for Subcontract workers’ working environment’ conducted by HHI union and subcontracting branch, self-paid for work-related injury was 50.4%, which was more than half. Paid by their subcontracting companies was 43.7% and the Worker’s Compensation case was only 3.7%. For the reason why cases were not dealt through the Worker’s Compensation process, more than half, 50.9% responded ‘being afraid of disadvantages such as dismissal, subcontracting company’s shut down and being nominated in a blacklist’. ‘By the Subcontracting company’s request followed by the shipyard owner company’s pressure’ came the next at 22.3% and ‘not knowing any information about the Worker’s Compensation application’ followed at 17%. In conclusion, the vicious circle runs around by subcontracting companies pushing their workers to avoid disadvantages from the shipyard and subcontract workers obey what their companies ask due to the job security. Sum up the exemption amount for last 5 years (2009~2013), it reaches up to 100 billion won (approx. $90 million). This is because of the structure that counts only their directly hired employees regardless the number of injured subcontract workers and that’s why the ‘outsourcing of danger’ is putting more subcontract workers into dangerous works and is becoming accelerated. “There was a transport signaler’s fatality last year working in bad weather and falling into the sea. He couldn’t see in the dark and rain but he wouldn’t have died if there had been a safety fence. During last year, 13 subcontract workers were killed at HHI and Hyundai Mipo Dockyard. (9 at HHI only) - basically, one per month. The criticism toward the ‘shipyard of death’ was heavier than ever and the Ministry of Employment and Labor ordered additional supervision as well as HHI’s own disaster prevention measures but 2 more subcontract workers were killed consecutively early this year despite the supposed changes.